The Kurdish Peshmerga, far from being a homogeneous army, is in fact two contingents divided along the lines of the Iraqi Kurds’ two rival political groupings, the Democratic Party of Kurdistan (KDP) and the Patriotic Union of Kurdistan (PUK). Both contingents pledge formal allegiance to the Kurdish Regional Government (KRG) of autonomous Kurdistan, whose president is the KDP leader Masoud Barzani and his capital, Irbil. But this pledge is less binding on the PUK, which rules the eastern region of the autonomous republic from the town of Suleimaniyeh and is closer to Iran. Relations between Barzani and Talabani and their clans are riddled with animus and mistrust. The former prefers ties with the US and several European capitals, while the latter is close to Tehran and Iranian Revolutionary Guards officers, including Gen. Qassem Soleimani, the al-Qods chief who is supreme commander of Iranian forces in the Middle East. Since Soleimani also commands the Iraqi Shiite militias taking part in the Mosul liberation offensive launched this week by a US-led coalition, the conflicting orientations of the two halves of the Kurdish Peshmerga bear heavily on its role in that operation. In fact, the contingent loyal to Barzani, which is fighting under US command, is motivated by one goal, which is to free Mosul’s two Kurdish neighborhoods from ISIS and attach them to the KRG under the rule of Irbil. 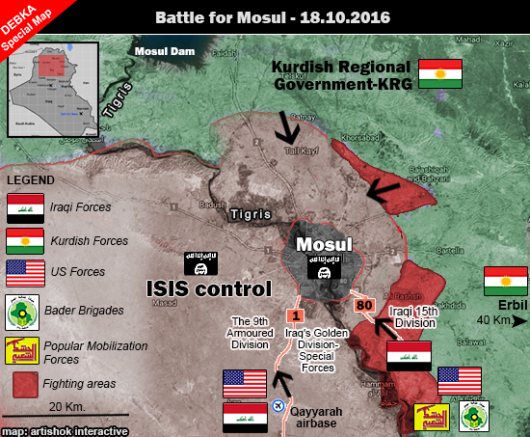 The rival Peshmerga contingent is following a completely different operational plan, an escapade with the potential for torpedoing the entire US-Iraqi Mosul offensive and taking it in the opposite direction from that charted by Washington and Baghdad. This plan is already afoot. DEBKA Weekly’s military and intelligence sources disclose that the Mosul operation has brought two additional Kurdish groups into play, so ratcheting up the risk of hair-raising disasters. Shortly before the Mosul attack began, a large 15,000-strong detachment of the Syrian Kurdish PYD-YPG militia landed in the Sinjar Mountains, a 100-km range in northern Iraq which runs east to west to the west of Mosul. They were assisted in crossing the border by none other than the Turkish army. As recently as August, this militia was locked in battle with the Turkish army in northern Syria and ordered by US Vice President Joe Biden who was visiting Ankara to retreat without delay to the eastern bank of the Euphrates River. So why did Turkish President Tayyip Erdogan, whose loathing of Kurds is famous, suddenly decide to give the Syrian Kurdish fighters a helping hand for joining their brethren in Iraq? According to our military sources, the Syrian Kurdish detachment plans to head 170km south to the Iraqi Sunni Arab town of Shirqat, west of the Tigris in the Salahadin Governorate, thereby circling around the KRG to link up with the Peshmerga units loyal to Talabani. At this point, the Iranian general Soleimani will step into the picture with orders to the Iraqi Shiite Bader Brigade and Popular Mobilization Units, which have joined the Iraqi military assault to the east of Mosul, to open a corridor for the pro-Talabani Kurdish fighters to move east. This movement will potentially culminate in a classical confrontation between two armies: To one side, Sunni units of the Iraqi government army plus pro-Barzani Peshmerga forces backed by the United States; to the other, Iraqi Shiites and Syrian and pro-Talabani Kurds backed by Turkey and Iran. The Obama administration’s long-awaited campaign to liberate Mosul from the Islamic State is liable to degenerate into a proxy war erupting in Iraq with America finding itself ranged willy-nilly against Turkey and Iran with Russia in the wings.